Hi friends! 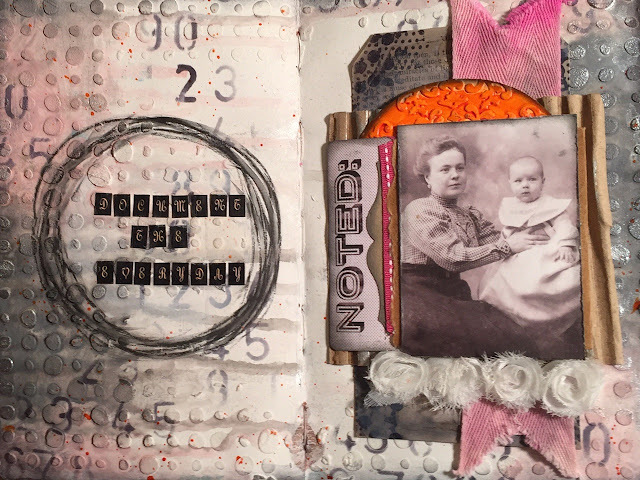 I'm back today with another art journal layout. 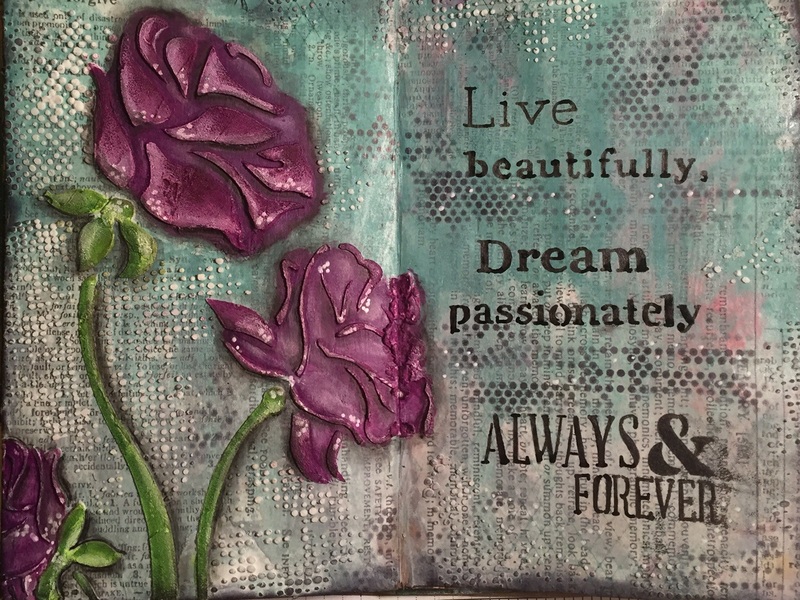 This is one that I created as a sample for my Art Journaling Made Simple class, that took place at the beginning of October. The goal of the class was to create three different backgrounds, and then work to add layers on to the pages to create finished pieces. 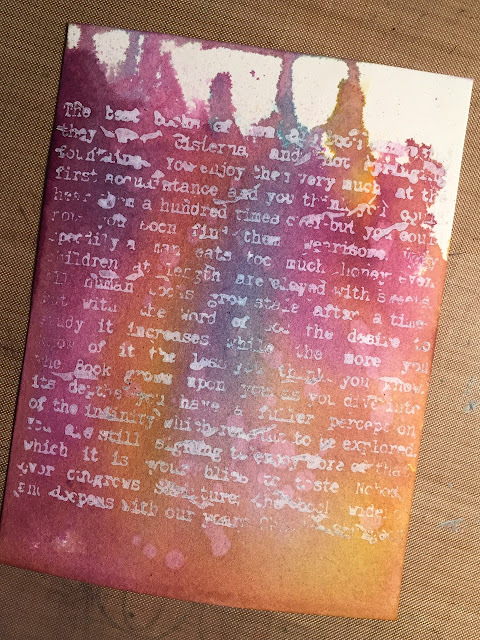 Once the paste was dry I added color with a few ink sprays and watered down paint, which I allowed to drip towards the center of the journal. 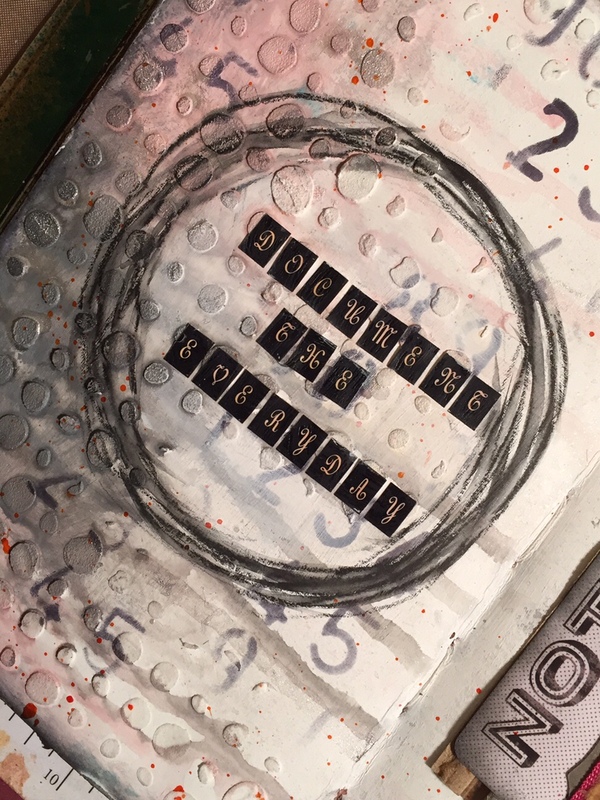 Next, I added another layer using Donna Downey's Numbers Repetitive stencil. 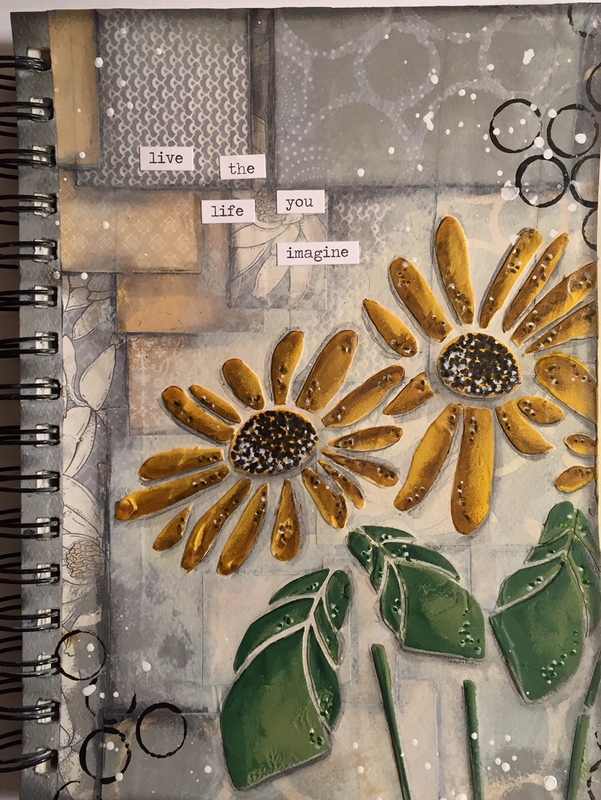 (Side note: I have to add that I adore Donna's stencils...great designs and the perfect size for art journals. The generous 8x8 design makes it the perfect fit for most journals!) I used Jet Black Archival Ink and a blending tool to add the stencil design. The last layer, before my collage was added, was some orange spottie dots, created with Golden Liquid Acrylics and a brush. I love the pop of orange against the background. The last step was to create the photo collage, which is really just a combination of a bunch of scraps I had sitting on my desk. The photo is from Tim's Found Relatives collection, and the Noted card is also from Tim, the Pocket Cards. All of the other pieces are just random bits of ribbon, a die cut that I painted orange, a piece of cardboard, and a manila tag with bits of stenciling and text paper. It's a lot of fun to gather together a bunch of random pieces and make them all fit together...it's like a super artsy puzzle! 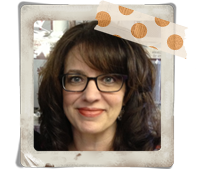 After the collage was finished, I added a quote, "Document the Everyday," using stickers from my giant alphabet sticker stash. The circle around the quote was created using a Stabilo pencil, and then tracing over the pencil with a waterbrush. That's it for today's art journaling installment...hope you enjoyed!! Personal news...We are moving to CT, my friends! Our house sold, after being on the market only two weeks...it's nothing short of a miracle! We're now in the process of looking for housing, starting to wrap our minds around packing (oh, how I dislike it), and trying not to think about how sad it's going to be to leave our friends and family. We're excited about new opportunities, but sure wish leaving our loved ones wasn't so hard...Stay tuned for more details! I'll only be teaching a few more classes in November and then it will be the start of a new journey!! 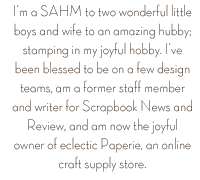 I started by covering both pages with Tim Holtz Tissue Wrap (we worked in the small Dylusions journal) using Matte Medium to adhere the pages. The next step was to cover the pages with a combination of Distress Paint colors. I used Evergreen Bough and Weathered Wood. 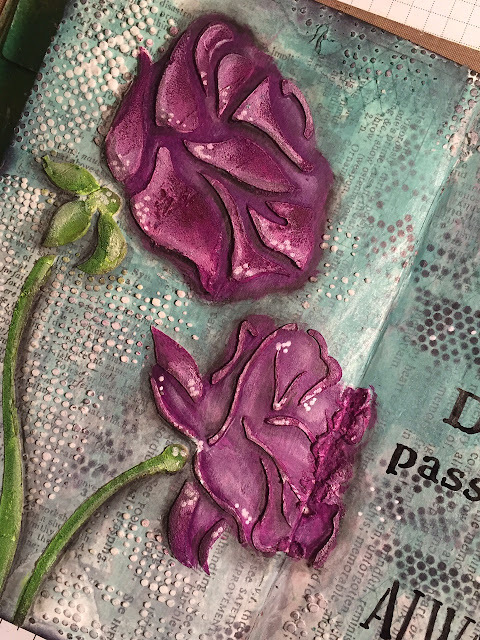 When the paste was dry, I used Dina Wakley acrylic paints to color in the details. You'll notice that I colored a complete flower, not just the areas with the paste, which is what is seen using the stencil. The purple sitting on just the paste didn't look right so I filled in all of the flower areas. I loved the end result as the flowers look more dimensional. I create a lot of shading using Faber Castell Big Brush Markers and more paint. As a final tough, I went around a few of the paste spots with a black Stabilo pencil. Using a waterbrush, I went over the Stabilo pencil to blend the black and create shading. The quote on the right was part of the stencil so I just used black paint to stencil the letters. I did go over the letters with a black Sharpie to beef up the width of each letter. The tiny black dots are from the Tiny Circles stencil from The Crafters Workshop. I hope you enjoyed today's art journal layout! 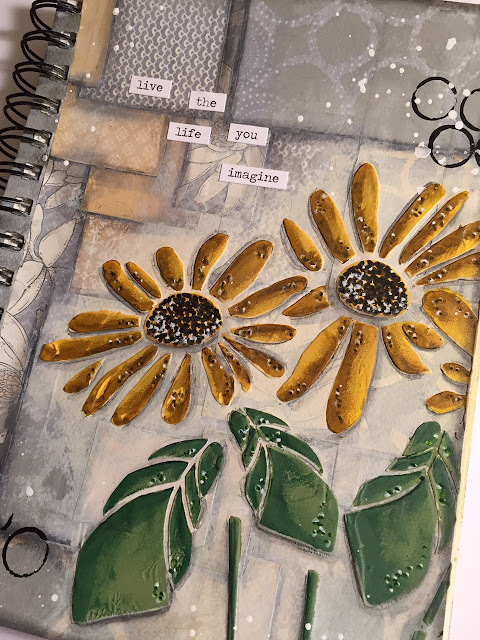 I'll be teaching an art journal basics class next Friday (October 23) at the Michaels in Epping, NH. Details can be found here. ﻿I'm using a piece of watercolor paper (you'll need a heavier cardstock for this technique), gesso (Liquitex is my fav), a sponge, and background stamp, I'm using the Typewriter Text background stamp from Sweet 'n Sassy. Stamp onto the piece of watercolor paper. You'll see that some of the archival ink, that was on my stamp 'cause I never clean my stamp, came off with the gesso. This won't affect the results. Be sure to clean your stamp immediately after stamping as the gesso will harden and effect the use of your stamp. Next, grab a few Distress Stains and a water bottle. 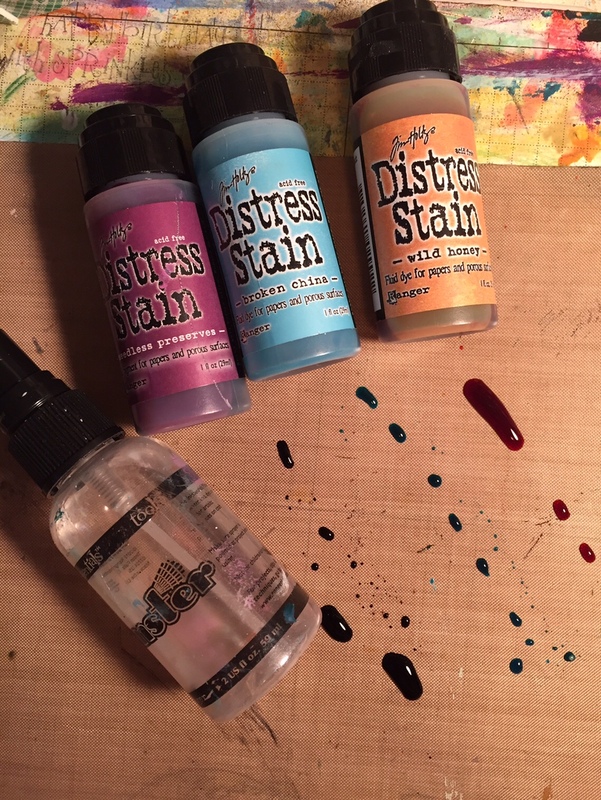 Apply the Distress Stains to a non-stick craft sheet, you can see my bottles above each color, and then spritz the stains with some water. This will allow the color to freely move over the watercolor paper. Swipe the cardstock through the ink. Be careful not to move the cardstock around too much or your colors will become muddy (well, my colors would 'cause I'm using colors on the opposite side of the color wheel! LOL!). 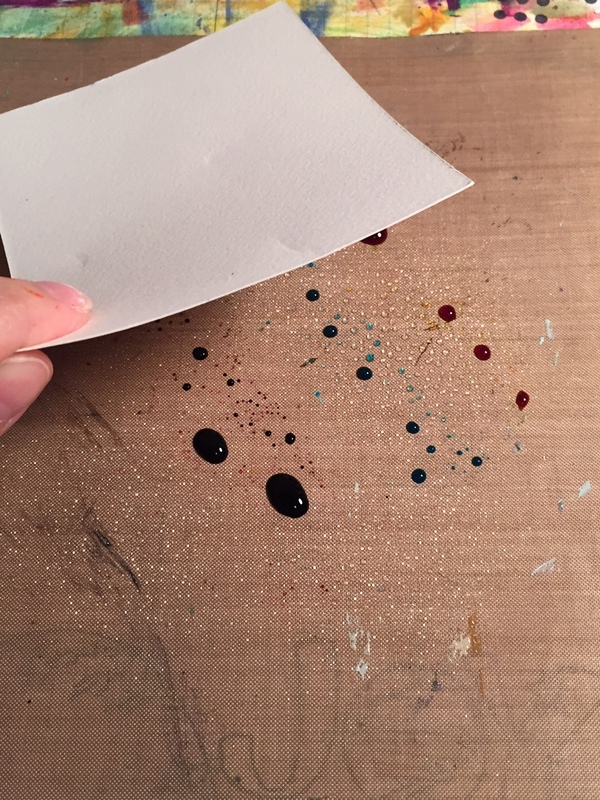 Spritz your cardstock with more water if you want the color to move around more. Check out these results! Ohhh...love it! The gesso resists the stains, making the background design pop out...love it! You can see how I allowed the stains to drip off of the page. I had originally intended to cut a shape out of this piece of paper, but I loved the drips so much I use the entire piece! 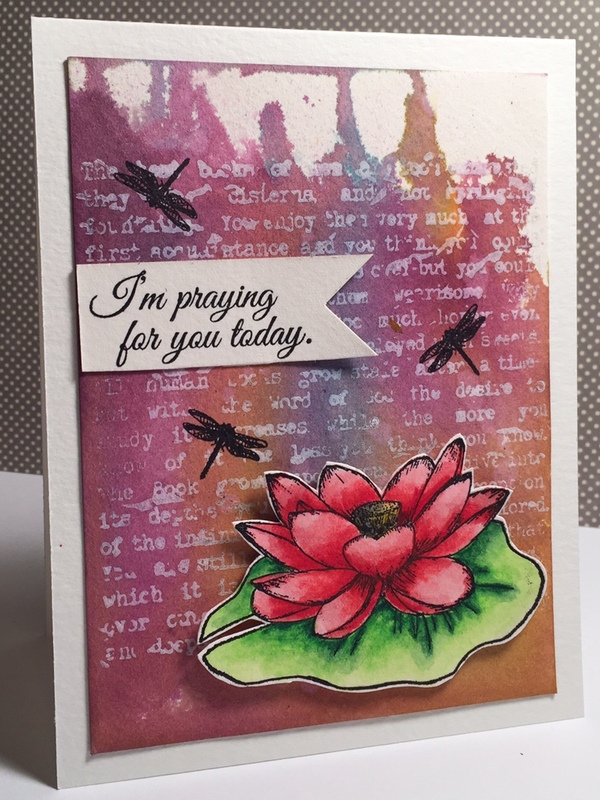 I finished my card by adding a flower from the Lovely Lotus stamp set, colored with Faber Castell watercolor pencils, a few dragonflies, from the same set, and a sentiment. Hope you enjoyed today's tutorial!! If you're interested in more of my video tutorials, including other gesso resist projects, subscribe to my You Tube Channel, here. 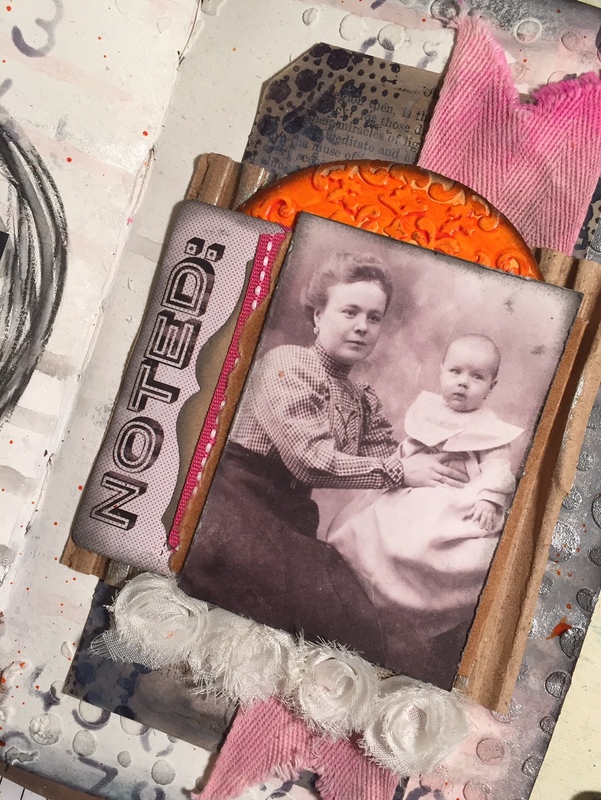 This class we'll explore a variety of mixed media techniques as we create an art journal cover. 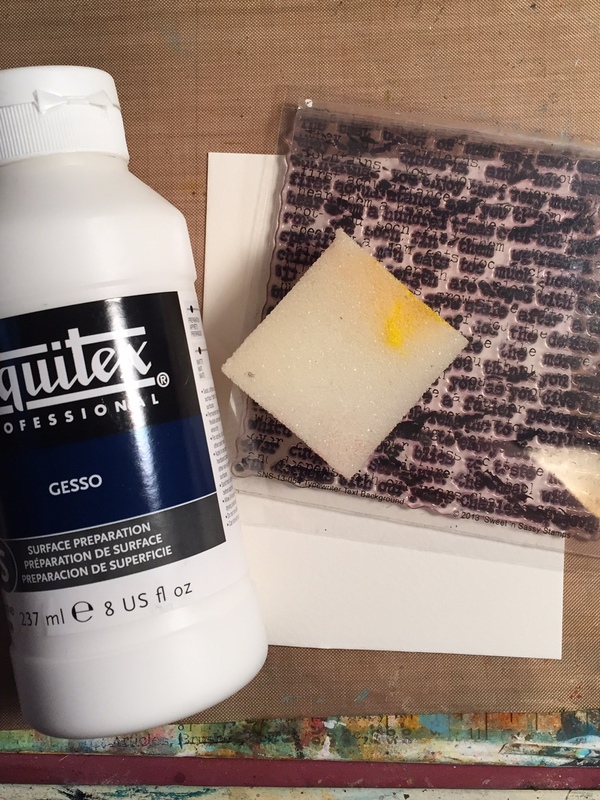 I'll demonstrate the use of different mediums, including gel medium and modeling paste. We'll also review collage techniques, stenciling, and shading using Faber Castell Big Brush Markers. You'll leave the class with a completed art journal cover and lots of blank art journal pages ready for more art!